The Reverend Martin Luther King, Jr. Ph.D., (January 15, 1929 – April 4, 1968) was a Nobel Laureate, Baptist minister, and African American civil rights activist. He is one of the most significant leaders in U.S. history and in the modern history of non-violence, and is considered a hero, peacemaker and martyr by many people around the world. A decade and a half after his 1968 assassination, Martin Luther King Day, a U.S. holiday, was established in his honor. King was born in Atlanta, Georgia to the Rev. Martin Luther King, Sr. and Alberta Williams King. (Birth records list King's first name as Michael, apparently due to some confusion on the part of the family doctor regarding the true name of his father, who was known as Mike throughout his childhood.) He graduated from Morehouse College with a Bachelor of Arts degree in Sociology in 1948. His application to Yale Divinity School was rejected, and he graduated from Crozer Theological Seminary in Chester, Pennsylvania  with a Bachelor of Divinity in 1951. He received his Ph.D. in Systematic theology from Boston University in 1955. Later, however, scholars at the King Papers project found that King plagiarized portions of his doctoral dissertation and academic papers, although Boston University did not revoke King's degree. For further information see authorship issues. King married Coretta Scott on June 18, 1953. The wedding ceremony took place in Scott's parents' house in Marion, Alabama, and was performed by King's father. In 1954, King became the pastor of the Dexter Avenue Baptist Church in Montgomery, Alabama. He was a leader of the 1955 Montgomery bus boycott which began when Rosa Parks refused to comply with Jim Crow law and surrender her seat to a white man. The boycott lasted for 381 days. The situation became so tense that King's house was bombed. King was arrested during this campaign, which ended with a United States Supreme Court decision outlawing racial segregation on intrastate buses. 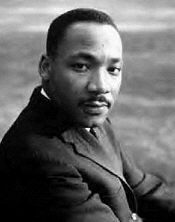 Following the campaign, King was instrumental in the founding of the Southern Christian Leadership Conference (SCLC) in 1957, a group created to harness the moral authority and organizing power of black churches to conduct nonviolent protests in the service of civil rights reform. King continued to dominate the organization until his death. The organization's nonviolent principles were criticized by the younger, more radical blacks and challenged by the Student Nonviolent Coordinating Committee (SNCC) then headed by James Foreman. The SCLC derived its membership principally from black communities associated with Baptist churches. King was an adherent of the philosophies of nonviolent civil disobedience used successfully in India by Mahatma Gandhi, and he applied this philosophy to the protests organized by the SCLC. King correctly identified that organized, nonviolent protest against the racist system of southern segregation known as Jim Crow would lead to extensive media coverage of the struggle for black equality and voting rights. Indeed, journalistic accounts and televised footage of the daily deprivation and indignities suffered by southern blacks, and of segregationist violence and harassment of civil rights workers and marchers, produced a wave of sympathetic public opinion that made the Civil Rights Movement the single most important issue in American politics in the early 1960s. King organized and led marches for blacks' right to vote, desegregation, fair hiring, and other basic civil rights. Most of these rights were successfully enacted into United States law with the passage of the Civil Rights Act of 1964 and the Voting Rights Act of 1965. King and the SCLC applied the principles of nonviolent protest with great success by strategically choosing the method of protest and the places in which protests were carried out in often dramatic stand-offs with segregationist authorities. Sometimes these confrontations turned violent. King and the SCLC were instrumental in the unsuccessful protest movement in Albany, in 1961–1962, where divisions within the black community and the canny, low-key response by local government defeated efforts; in the Birmingham protests in the summer of 1963; and in the protest in St. Augustine, Florida, in 1964. King and the SCLC joined forces with SNCC in Selma, Alabama, in December 1964, where SNCC had been working on voter registration for a number of months. King and SCLC, in partial collaboration with SNCC, then attempted to organise a march from Selma to the state capital of Montgomery, for March 25, 1965. The first attempt to march on March 7, was aborted due to mob and police violence against the demonstrators. This day since has become known as Bloody Sunday. Bloody Sunday was a major turning point in the effort to gain public support for the Civil Rights Movement, the clearest demonstration up to that time of the dramatic potential of King's nonviolence strategy. King, however, was not present. After meeting with President Lyndon B. Johnson, he had attempted to delay the march until March 8, but the march was carried out against his wishes and without his presence by local civil rights workers. The footage of the police brutality against the protestors was broadcast extensively across the nation and aroused a national sense of public outrage. The second attempt at the march on March 9 was ended when King stopped the procession at the Edmund Pettus Bridge on the outskirts of Selma, an action which he seemed to have negotiated with city leaders beforehand. This unexpected action aroused the surprise and anger of many within the local movement. The march finally went ahead fully on March 25, with the agreement and support of President Johnson, and it was during this march that Willie Ricks coined the phrase "Black Power" (widely credited to Stokely Carmichael). King, representing SCLC, was among the leaders of the so-called "Big Six" civil rights organizations who were instrumental in the organization of the March on Washington for Jobs and Freedom in 1963. The other leaders and organizations comprising the Big Six were: Roy Wilkins, NAACP; Whitney Young, Jr., Urban League; A. Philip Randolph, Brotherhood of Sleeping Car Porters; John Lewis, SNCC; and James Farmer of the Congress of Racial Equality (CORE). For King, this role was another which courted controversy, as he was one of the key figures who acceded to the wishes of President John F. Kennedy in changing the focus of the march. Kennedy initially opposed the march outright, because he was concerned it would negatively impact the drive for passage of civil rights legislation, but the organizers were firm that the march would proceed. The march originally was conceived as an event to dramatize the desperate condition of blacks in the South and a very public opportunity to place organizers' concerns and grievances squarely before the seat of power in the nation's capital. Organizers intended to excoriate and then challenge the federal government for its failure to safeguard the civil rights and physical safety of civil rights workers and blacks, generally, in the South. However, the group acquiesced to presidential pressure and influence, and the event ultimately took on a far less strident tone. As a result, some civil rights activists who felt it presented an inaccurate, sanitized pageant of racial harmony; Malcolm X called it the "Farce on Washington," and members of the Nation of Islam who attended the march faced a temporary suspension. The march did, however, make specific demands: an end to racial segregation in public school; meaningful civil rights legislation, including a law prohibiting racial discrimination in employment; protection of civil rights workers from police brutality; a $2 minimum wage for all workers; and self-government for the District of Columbia, then governed by congressional committee. Despite tensions, the march was a resounding success. More than a quarter of a million people of diverse ethnicities attended the event, sprawling from the steps of the Lincoln Memorial onto the National Mall and around the reflecting pool. At the time, it was the largest gathering of protestors in Washington's history. King's I Have a Dream speech electrified the crowd. It is regarded, along with President Lincoln's Gettysburg Address, as one of the finest speeches in the history of American oratory. Throughout his career of service, King wrote and spoke frequently, drawing on his long experience as a preacher. His "Letter from Birmingham Jail", written in 1963, is a passionate statement of his crusade for justice. On October 14, 1964, King became the youngest recipient of the Nobel Peace Prize, which was awarded to him for leading non-violent resistance to end racial prejudice in the United States. King was long hated by many white southern segregationists, but this speech turned the more mainstream media against him. TIME called the speech "demagogic slander that sounded like a script for Radio Hanoi (a propaganda radio station run by the North Vietnamese Army during the Vietnam War)", and the Washington Post declared that King had "diminished his usefulness to his cause, his country, his people." In 1968, King and the SCLC organized the "Poor People's Campaign" to address issues of economic justice. The campaign culminated in a march on Washington, D.C. demanding economic aid to the poorest communities of the United States. It really doesn't matter what happens now.... some began to... talk about the threats that were out -- what would happen to me from some of our sick white brothers.... Like anybody, I would like to live a long life. Longevity has its place, but I'm not concerned about that now. I just want to do God's will. And He's allowed me to go up to the mountain. And I've looked over, and I've seen the Promised Land. I may not get there with you. But I want you to know tonight, that we, as a people, will get to the Promised Land. And so I'm happy tonight. I'm not worried about anything. I'm not fearing any man. Mine eyes have seen the glory of the coming of the Lord. King was assassinated the next evening, April 4, 1968, at 6:01pm, on the balcony of the Lorraine Motel in Memphis, Tennessee, while preparing to lead a local march in support of the heavily black Memphis sanitation workers' union which was on strike at the time. Friends inside the motel room heard the shot fired and ran to the balcony to find King shot in the jaw. He was pronounced dead several hours later. The assassination led to a nationwide wave of riots in more than 60 cities. Four days later, President Lyndon Johnson declared a national day of mourning for the lost civil rights leader. A crowd of 300,000 attended his funeral that same day. Two months after King's death, escaped convict James Earl Ray had been captured at London's Heathrow Airport while trying to leave Great Britain on a false Canadian passport in the name of Ramon George Sneyd. Ray was quickly extradited to Tennessee and charged with King's murder, confessing to the assassination on March 10, 1969, (though he recanted this confession three days later) and was sentenced to 99 years in prison. Ray, a presumed white supremacist and segregationist, had allegedy killed King because of the latter's extensive civil rights work. On the advice of his attorney Percy Foreman, Ray had taken a guilty plea to avoid a trial conviction and thus the definite possibility of receiving the death penalty although it was highly unlikely that he would have been executed even if he had been sentenced to death, as the US Supreme Court's 1972 decision in the case of Furman v. Georgia invalidated all state death penalty laws then in force. Ray had fired Foreman as his attorney (from then on derisively calling him "Percy Fourflusher") claiming that a man he met in Montreal, Canada with the alias "Raoul" was involved, as was his brother Johnny, but not himself, further asserting that although he didn't "personally shoot Dr. King," he may have been "partially responsible without knowing it," hinting at a conspiracy. He spent the remainder of his life attempting (unsuccessfully) to withdraw his guilty plea and secure the trial he never had. Some speculate Ray had been a patsy much in the way alleged John Kennedy assassin Lee Harvey Oswald had supposedly been. Among the claims used to support this assertion are the fact that the Remington Gamemaster Model 760 .30-06 caliber rifle Ray (a burglar and thief but not a killer or other violent criminal) had allegedly used to shoot Dr. King had only two of Ray's fingerprints on it while the second-floor bathroom of Ray's rooming house, from where Ray (an average marksman who hadn't fired a rifle since his Army service in the late 1940s) was believed to have fired at King, contained none of Ray's fingerprints at all. Many suspecting a conspiracy in the assassination point out the two separate ballistic tests conducted on the Remington Gamemaster had neither conclusively proved Ray had been the killer nor that it had even been the murder weapon. Moreover, witnesses surrounding King at the moment of his death say the shot came from another location, from behind thick shrubbery near the rooming house, not from the rooming house itself, shrubbery which had been suddenly and inexplicably cut away in the days following the assassination. Also, Ray's petty criminal history had been one of colossal and repeated ineptitude, he'd been quickly and easily apprehended each time he committed an offense, behavior in sharp contrast to that of his shortly before and after the shooting; he'd easily managed to secure several different pieces of legitimate identification, using the names and personal data of living men who all coincidentally looked like and were of about the same age and physical build as Ray, he spent large sums of cash and traveled overseas without being apprehended at any border crossing, even though he had been a wanted fugitive. According to Ray, all of this had been accomplished with the aid of the still unidentified "Raoul." Investigative reporter Louis Lomax had also discovered the Missouri Department of Corrections, shortly after Ray's April 1967 prison escape, had sent the incorrect set of fingerprints to the FBI and had failed to notice or correct this error. Lomax had been publishing a series of investigative stories on the King assassination for the North American Newspaper Alliance, stories challenging the official view of the case, and had been reportedly pressured by the FBI to halt his investigation. According to a former Pemiscot County, Missouri deputy sheriff, Jim Green, who claimed to have been part of an Federal Bureau of Investigation (FBI)-led conspiracy to kill Dr. King, Ray had been targeted as the patsy for the King assassination shortly before his April 1967 prison escape and had been tracked by the Bureau during his year as a fugitive. After several trips to and from Canada and Mexico during this time, Ray had gone to Memphis after agreeing to participate (allegedly controlled by his mysterious benefactor "Raoul" who reportedly had weeks before while in Birmingham, Alabama ordered Ray to purchase the Remington Gamemaster rifle) in what he was told was a major bank robbery while King was in town--since city police resources would be dedicated toward maintaining security for King and his entourage, the intended bank heist would be much simpler than usual. Green (who, like Ray, had asserted that FBI assistant director Cartha DeLoach headed the assassination plot) had claimed Ray had been ordered to stay in the rooming house and as a diversion for the purported bank heist, to then hold up a small diner near the rooming house at approximately 6:00 p.m. on April 4th. Dr. King was shot a minute later by a sniper hidden in the shrubbery near the rooming house. Meanwhile, according to Green, two men, one of them allegedly a Memphis police detective, were waiting to ambush and kill Ray while Ray was on his way to the planned diner holdup and then plant the Remington rifle in the trunk of Ray's pale yellow (not white) 1966 Ford Mustang, effectively framing a dead man. However, moments before the assassination, Ray had apparently suspected a setup and instead quickly left town in his Mustang, heading for Atlanta, Georgia. Atlanta police found Ray's abandoned Mustang six days after King had been shot. Ray and six other convicts escaped from Brushy Mountain State Penitentiary in Petros, Tennessee on June 10, 1977 shortly after Ray testified that he did not shoot King to the House Select Committee on Assassinations, but were recaptured on June 13 and returned to prison. More years were then added to his sentence for attempting to escape from the penitentiary. In 1997 Martin Luther King's son Dexter King met with Ray, and publicly supported Ray's efforts to obtain a trial. In 1999, Coretta Scott King, King's widow (also a civil rights leader), along with the rest of King's family won a wrongful death civil trial against Loyd Jowers and "other unknown co-conspirators". Jowers claimed to have received $100,000 to arrange King's assassination. The jury of six whites and six blacks found Jowers guilty and that "governmental agencies were parties" to the assassination plot. Rev. Jesse Jackson, who was with King at the time of his death, noted "The fact is there were saboteurs to disrupt the march. [And] within our own organization, we found a very key person who was on the government payroll. So infiltration within, saboteurs from without and the press attacks. ... I will never believe that James Earl Ray had the motive, the money and the mobility to have done it himself. Our government was very involved in setting the stage for and I think the escape route for James Earl Ray." King biographer David Garrow disagrees with William F. Pepper's claims that the government killed King. He is supported by King assassination author Gerald Posner.